Both plastic bins and plastic containers are items that will effectively reduce your parts handling time and help you maintain a cleaner and more organized work area. Bin storage systems allow you to store multiple different products and SKUs in an organized fashion. This will give you more time to focus on other more important things in your business. For over 80 years in the material handling industry, the S. W. Betz Company has solved many customer problems with plastic bins and containers. With many different, sizes, shapes, and colors, our team will be able to help your operation become more efficient with the addition of plastic bins and containers or a bin storage system. The S. W. Betz Company currently distributes plastic bins and containers from some of the most reputable manufacturers in the industry including Quantum Storage Systems and LewisBins+. Some of the different products in this line that we provide are listed below. If you are in need of, or would like more information on, any of our plastic bins and containers, please contact us and one of our team members will be happy to assist you. 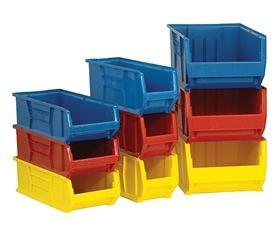 For more information about Plastic Bins & Containers or any other product or service from S.W. Betz, fill out and submit the form to the right.